Background: Most X-ray centers recruited for this study admitted that there have been no maintenance checks on the energy output accuracy of their X-ray machines. Most centers complained of recurrent machine breakdown due to poor power supply, while others pointed out that X-ray machine age could be a contributory factor to poor image quality. Aim and Objectives: To determine peak kilovoltage (kVp) accuracy of individual X-ray unit and to compare their values with recommended standards and to further establish if machine age has a significant effect on mean kVp accuracy. Materials and Methods: One dedicated conventional X-ray unit in each of the ten diagnostic centers was used for this study denoted as D 1−D 10 . kVp was measured using a noninvasive Unfors ThinX RAD kVp meter. The kVp accuracy test was carried out by positioning the Unfors ThinX RAD kVp meter at the center of the beam axis of the patient's couch at a focus to image distance of 100 cm. The X-ray machine technical factors were varied by selecting tube potential within the range of 50−120 kVp at a fixed tube current of 20 mA. Data analysis value was done using GraphPad Prism version 5.0 statistics software (GraphPad Software, Inc., San Diego, California, USA). Results: The kVp accuracy test for X-ray units D 1 , D 2 , D 5 , D 6 , D 7 , and D 8 were within an acceptable limit of ±5% at all selected tube potential from 50 to 120 kVp, X-ray units D 2 and D 6 showed accurate compliance at much lower kVp accuracy values. X-ray units D 3 and D 10 were above ±5% accuracy limit at all selected kVp tube potential. No statistically significant differences exist between machine age and mean kVp accuracy (P = 0.770). Conclusion: One-fourth of the total kVp accuracy results were above ±5% limit. Old X-ray machine had higher chances of failed kVp accuracy. Traces of failed test were also noticed in X-ray machines below 5 years. In diagnostic radiology, the kVp is one of the most important parameter affecting both radiation exposure and image contrast (the amount of difference between the black/whites on the radiograph). The X-ray kVp is most critical; a small error of this variable will have a greater effect on the final radiographic or fluoroscopic image than an equivalent variation in any of the other parameters such as tube current (mA), exposure time, and focus to image distance (FID). , It is, however, important to note that selected exposure factors such as the kVp and milliampere seconds (mAs) can only be accurate if the X-ray machine is functioning optimally. Final accurate radiograph can be obtained when appropriate kVp and mAs valued are selected, as well as proper patient positioning is observed, proper use of image intensifying screen, the use of appropriate grid to reduce patient dose where appropriate, the use of appropriate air gap technique and good processing devices (manual processing/automatic processor/digital processor). In a previous study, it was reported that "there are over 4000 X-ray machines in Nigeria with <5% of them under any form of regulatory control." In Nigeria, the Nigerian Nuclear Regulatory Authority (NNRA) is saddled with the responsibility of registering, licensing, inspecting, and enforcing nuclear safety and radiological protection in all practice in the country. Over the years, there have been the problems of feedbacks between regulators and end users in terms of compliance with QC programs of X-ray facilities in Nigeria. In this study, radiographers that were recruited admitted that there has been no maintenance check on the energy output of their X-ray machines, and they also reported recurrent breakdown due to power failure with no QC checks after repairs. Others pointed out that X-ray machine age could be a contributory factor to poor image quality. The reason why this study focused more on kVp was to carry out a QC kVp accuracy test on the energy output of X-ray generator, to encourage end user of the need to carry out kVp accuracy test each time repair works are done. This study was therefore carried out to determine energy output accuracy of ten X-ray machines by first determining the kVp accuracy of each X-ray unit and comparing them with established standard and to further establish if machine age has a significant effect on mean kVp accuracy. 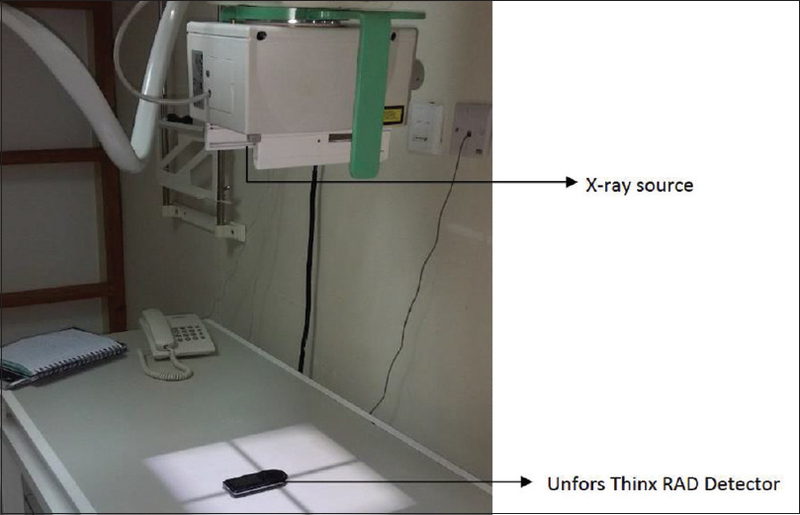 In this prospective cross-sectional study carried out between August and November 2015, convenience simple random sampling technique was used to select 10 X-ray centers in Lagos metropolis that have both mobile and static (ceiling mounted) conventional X-ray machines. Both mobile and static X-ray machine voltage range was 50−150 kVp and quantity (Q = It) which is a product of the tube current and exposure time in seconds was within the range of 0.2-800 mAs [Table 1]. However, only X-ray centers with at least one functional X-ray machine was selected. Eight out of the ten X-ray centers were diagnostic based while two were hospital-based, having Radiology Departments. Seven out of 10 centers used manual and automatic processing devices while three centers used digital processing systems. It was discovered that four centers did not have operational and circuit manuals. Radiographers reported that manuals were misplaced, lost, not supplied, or taken away by service engineers after repair work. Physical inspection was used to in getting manufacture date and installation dates of lost manuals. The investigation also showed that most of the X-ray machines that were tagged "new" were actually refurbished. Furthermore, only radiographers with at least 2-3 years job experience were recruited into the study. Recruited radiographers were all registered and licensed to practice in the country by Radiographers' Registration Board of Nigeria and they all gave verbal consent to take part in the study before being recruited. All X-ray machines for this study met National and International Certifications like European Conformity, International Organization for Standardization, International Electrotechnical Commission (IEC), Good Manufacturing Practice, and Food and Drug Administration among others. All X-ray machines used for this study were certified by NNRA for use. A certified medical physicist carried out kVp accuracy test assessment in each center using a kVp ThinX RAD detector (with serial number - 30001232 manufactured by Unfors). The ThinX RAD detector was considered most appropriate for this study because it is a small, fully automated noninvasive QC instrument that simultaneously measures the dose, dose rate, kVp, exposure time, and pulses using detectors. Where Xm is the measured value of peak tube kilovoltage (kVp) from the noninvasive meter, and Xs is the value of the selected kilovoltage (kV) from the control panel of the X-ray machine. A total of 10 X-ray units in 10 centers were used for this study [Table 2]. The mean ± standard deviation kVp accuracy for each unit denoted as D 1−D 10 was as follows: 0.94 ± 0.18, 0.49 ± 0.63, 9.25 ± 4.05, 3.31 ± 1.77, 3.72 ± 0.73, 0.99 ± 0.74, 1.54 ± 1.63, 1.19 ± 0.65, 4.18 ± 1.23, and 14.1 ± 3.45, respectively. 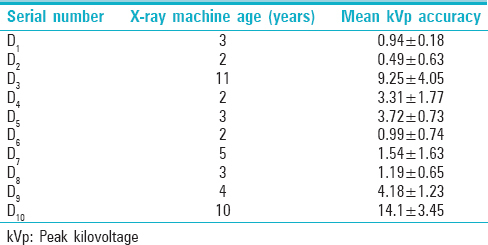 X-ray machine age from manufacture date to a time when the study was done for each unit D 1 to D 10 ranged from 2 to 11 years, and its mean kVp accuracy was between 0.49 ± 0.63 and 14.1 ± 3.45 [Table 3]. Paired two-sided t-test (unequal variance) P value at 0.05 levels was 0.770. 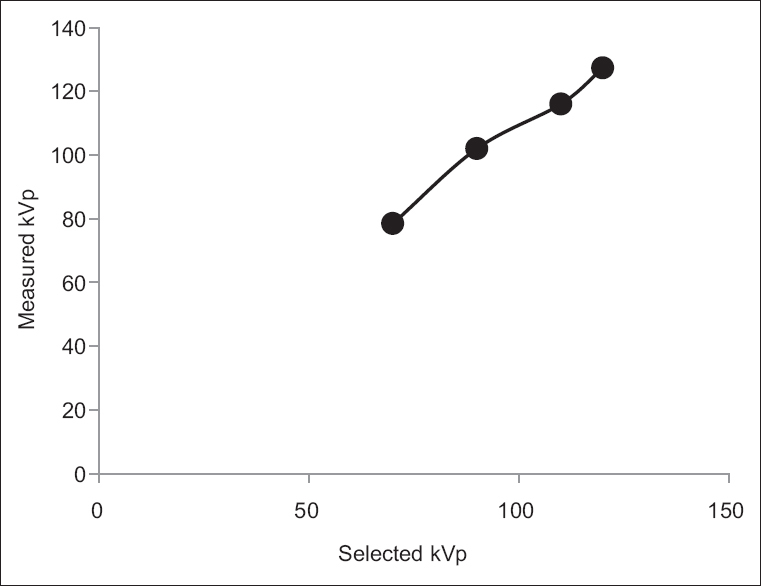 The graph [Figure 2] of one of the X-ray unit D 2 which passed the kVp accuracy test shows that the selected kVp values and measured kVp values were almost in direct proportion. 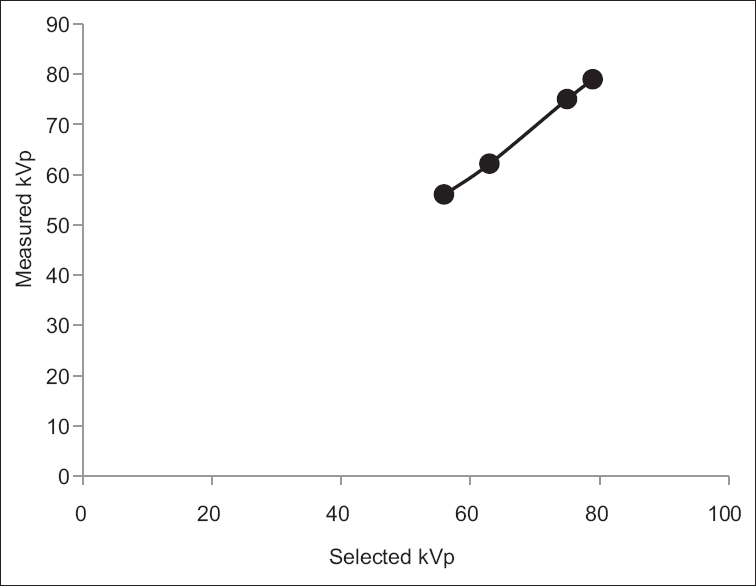 As the selected kVp value increases, the measured kVp also increases with a slight change. In addition, the graph of the X-ray unit D 10 which totally failed the kVp accuracy test shows that the selected kVp and measured kVp values were not in direct proportion [Figure 3]. 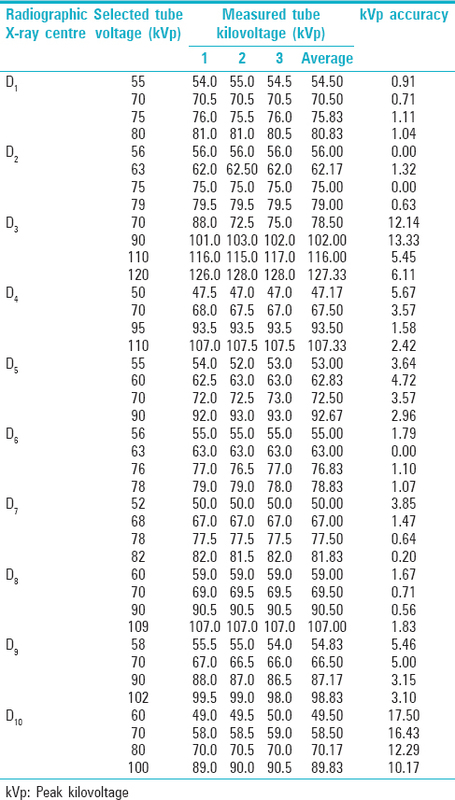 The kVp accuracy test for X-ray unit D 1 , D 2 , D 5 , D 6 , D 7 , and D 8 were within acceptable limit of ±5% at all selected tube potential from 50 to 120 kVp [Table 2], X-ray unit D 4 and D 9 failed the kVp test at 50kVp and 58kVp respectively, showing that not all selected kVp values passed the test. Two X-ray units D 2 and D 6 showed accurate compliance at much lower kVp accuracy values with their machine ages below 5 years. In this study, there was no statistically significant difference between X-ray machine age and mean kVp accuracy (P = 0.770) using the paired t-test. This result was seen to be consistent with a study by Alireza et al. whose study also showed that there was no significant difference between kVp accuracy and the machine age. Alireza et al. mean kVp accuracy was 3.3 ± 5.22, 3.86 ± 4.87, and 10.87 ± 5.56 and machine age was ≤10, 10-20 and ≥20 years, respectively. It was also discovered from his study that older X-ray machines have high chances of failed kVp accuracy. This was also seen in this study for machines between the ages of 10 and 11 years. The reason why there was no statistical difference was fact that some X-ray units (D 4 and D 9 ) which were below 5 years also failed the kVp accuracy test. Indicating that QC program is an antidote to checkmate X-ray machine performance irrespective of the age of the machine. In this study, a total of 40 kVp accuracy results were analyzed, from which 10 kVp results were above ± 5%. An overall result from this study indicated that one-fourth (25%) of the X-ray units failed the kVp accuracy test. Twenty percent of failed kVp was seen in X-ray machine between 10 and 11 years. Five percent of traces of failed kVp were also seen in X-ray machine below 5 years. Failed kVp accuracy test could be attributed to alighted problems being faced by radiographers (operators) who complained of a lack of maintenance test, frequent breakdown without recalibration of kVp and mAs after repairs and repeat X-ray examinations. One of the implications of failed kVp is the production of lower energy photons (X-rays), which in most cases are of no diagnostic purpose thereby affecting the outcome of the radiograph. A graph of measured kVp and selected kVp [Figure 2] show linear property of the tube potential for X-ray unit D 2 . This proofs that the KVp set value on the control panel produces X-rays with the almost same amount of comparable and consistent energy. The deviation was seen from the line graph in X-ray unit D 10 , which was inconsistent; proofing that there was distortion between the set kVp values and measured values [Figure 3]. X-ray unit D 3 with selected tube potential of 70, 90, 110, and 120 kVp had kVp accuracy of 12.14%, 13.33%, 5.45%, and 6.11% and X-ray unit D 10 with selected tube potential of 60, 70, 80, and 100 kVp had kVp accuracy of 17.50%, 16.43%, 12.29%, and 10.17%, respectively. The kVp accuracy for these X-ray units was above ±5% accuracy limits. ,, The reasons for these deviations could be attributed to line voltage supply (electrical faults) and X-ray machine age which was seen in older machines between 10 and 11 years. Although more studies needed to be done with large sample size to further verify this. In a similar study conducted by Mehrdad et al. in June 2015, in which seven hospitals were used in Iran, two of the oldest X-ray machines were installed in 1982 and 1990. Their kVp accuracy were 17.94% at 60 kVp, 11.19% at 70 kVp, 12.12% at 80 kVp, and 7.29% at 100 kVp for the first and 20.34% at 50 kVp, 8.11% at 60 kVp, 9.91% at 70 kVp, and 14.75% at 80 kVp for the second, showing that they were above ± 5% accuracy limit. X-ray unit D 3 and D 10 failed kVp range was 10.17−17.50% (10-11 years). These values were within those of Mehrdad et al. whose failed kVp accuracy range was 7.29−20.34% (26-34 years). In another study by Godfrey et al.,  kVp accuracy test was conducted in five hospitals in Zaria, Kaduna State, North-Western Nigeria in 2015. His study result shows that 67% of the overall kVp accuracy tests done at selected tube potential of 60, 70, 80, 90, and 100 kVp failed the kVp accuracy test with the highest failed kVp accuracy value of 51.5% noticed in one of the hospitals. Although there were no records from his study indicating the age of the X-ray machine. The result obtained from Godfrey et al. study was far higher than the maximum failed kVp value (17.50%) that was obtained in this study. A similar failed kVp accuracy test was observed in a study by Oluwafisoye et al. with an X-ray unit in Lagos South-West Nigeria among other test conducted, the selected tube potential were 65, 70, 75, and 80kVp and the measured tube potential were 56.78, 62.33, 68.78, and 71.34kVp, respectively. The failed kVp accuracy range was 8.29%−12.65%. Oluwafisoye et al. failed range was lower compared to this study. Agahahadi et al. assessed the impact of QC on radiation doses received by patients undergoing abdomen X-ray examination with 10 X-ray units in 10 different hospitals, his study also reveals that 3 out of 10 X-ray unit failed the kVp accuracy test (30%). Agahahadi et al. result was 5% higher when compared with this study. In a diagnostic X-ray facilities QC performances test conducted in 196 X-ray units in 19 regions in Tanzania by Sungita et al.,  his QC result demonstrated 59% failed kilovoltage (kVp), with all of the X-ray machines installed before the year 2000 (over 16 years). His study showed that kVp had the highest percentage failure compared to other QC test performed. Results obtained were 34% higher than this study. Sungita et al. further proved the vulnerability of using old X-ray machine. Some other factors that may have contribute to failed kVp accuracy test could be poor quality of electricity (low current) which is a major problem in Nigeria, variation in the line voltage supplying the X-ray generator, faulty high-voltage cables, autotransformer/KVp selection circuitry and X-ray generator age. The kVp accuracy of ten diagnostic X-ray units in 10 centers in Lagos metropolis has been determined. It was discovered that one-fourth of the total kVp accuracy result failed to meet the acceptable limit of ± 5%. X-ray machine between 10 and 11 years failed the kVp accuracy test contributing 20%. Traces of failed test were also seen in X-ray machine below 5 years, contributing 5%. There was no statistical significant difference between machine age and mean kVp accuracy for this study. Although high chances of failed kVp was noticed in older machines from 10 years. This fact might be a contributory factor to poor image quality. Further study with large sample size needed to be done to ascertain if kVp of older X-ray machine will affect image quality. There is a need for proper implementation of QA test during installation and control test from time to time after installation on both new and old diagnostic X-ray machine since failed kVp was noticed in machines below 5 years, this will further help to reduce repeated radiograph, hence reduction in rejected films and reduce patient dose. Immense thanks to all X-ray centers used within Lagos metropolis for this study and professor Aweda (postgraduate coordinator of Medical Physics LUTH) for his financial support and encouragement. Kramer HM, Selbach HJ, Iles WJ. The practical peak voltage of diagnostic X-ray generators. Br J Radiol 1998;71:200-9. Baorong Y, Kramer HM, Selbach HJ, Lange B. Experimental determination of practical peak voltage. Br J Radiol 2000;73:641-9. Bushberg JT, Seibert JA, Leidholdt EM, Boone JM. The Essential Physics of Medical Imaging. 2 nd ed. Baltimore: Lippincott Williams and Wilkins; 2002. p. 112-32. Dance DR, Christofides S, Maidment AD, McLean ID, Ng KH. Diagnostic Radiology Physics: A Handbook for Teachers and Students. Vienna: IAEA; 2014. p. 89-114. Tran NT, Iimoto T, Kosako T. Calibration of KVp meter used in quality control tests of diagnostic X-ray units. Radiat Prot Dosimetry 2012;148:352-7. American Association of Physicists in Medicine (AAPM). Basic Quality Control in Diagnostic Radiology. AAPM Report No. 4. Madison: Medical Physics Publishing; 1977. American Association of Physicists in Medicine (AAPM). Quality Control in Diagnostic Radiology. AAPM Report No. 74. Madison: Medical Physics Publishing; 2002.
International Atomic Energy Agency (IAEA). Radiation Protection and Safety of Radiation Source: International Basic Safety Standards, Series No. GSR Part 3, Vienna, Austria: IAEA publications; 2014. p. 2-85. Ngoye WM, Motto JA, Muhogora WE. Quality control measure in Tanzania: Is it done? J Med Imaging Radiat Sci 2015;46:S23-30. Elegba SB. Radiation Safety Officer (RSO) in Diagnostic and Interventional Radiology. Keynote Address, University of Ibadan, Ibadan, Nigeria. Available from: http://www.archive.punchontheweb.com/articl.aspx\. [Last updated on 2013 Dec 11; Last accessed on 2016 Feb 16]. Nigerian Nuclear Regulatory Authority (NNRA). Nigerian basic ionizing radiation regulations. Lagos, Nigeria: The Federal Government Press; 2003. Chan CT, Fung KK. Dose optimization in lumbar spine radiographic examination by air gap method at CR and DR systems: A phantom study. J Med Imaging Radiat Sci 2015;46:65-71. Welander U, Wickman G. Mean energy imparted in relation to the focus to object distance. Acta Radiol Diagn (Stockh) 1978;19:1014-24. Poletti JL, McLean D. The effect of source to image-receptor distance on effective dose for some common X-ray projections. Br J Radiol 2005;78:810-5. Shirin Shandiz M, Bahreyni Toosi MT, Farsi S, Yaghobi K. Local reference dose evaluation in conventional radiography examinations in Iran. J Appl Clin Med Phys 2014;15:4550. Rasuli B, Mahmoud-Pashazadeh A, Birgani MJ, Ghorbani M, Naserpour M, Fatahi-Asl J. Quality control of conventional radiology devices in selected hospitals of Khuzestan Province, Iran. Iran J Med Phys 2015;12:101-8. Rasuli B, Mahmoud-Pashazadeh A, Ghorbani M, Tabari Juybari R, Naserpour M. Patient dose measurement in common medical X-ray examinations in Iran. J Appl Clin Med Phys 2016;17:5860. Ismail HA, Ali OA, Omer MA, Garelnabi ME, Mustafa NS. Evaluation of diagnostic radiology department in term of quality control (QC) of X-ray units at Khartoum state hospitals. Int J Sci Res 2015;4:1875-8.
International Electrotechnical Commission. Medical electrical equipment-dosimetric instruments used for non-invasive measurement of X-ray tube voltage in diagnostic radiology (IEC 61676). Geneva, Switzerland: IEC publications; 2002. Alireza KK, Peyman H, Milad M, Shahin N. Quality control of radiography equipments in Golestan Province of Iran. Iran J Med Phys 2013;10:37-44. Mehrdad G, Fataneh N, Vahid K. The evaluation of conventional X-ray exposure parameters including tube voltage and exposure time in private and governmental hospitals of Lorestan Province, Iran. Iran J Med Phys 2015;12:85-92. Godfrey LD, Adeyemo DJ, Sadiq U. Radiological kVp accuracy, reproducibility and consistence assessment of some hospitals in Zaria environs of Kaduna state, Nigeria. Arch Appl Sci Res 2015;7:27-31. Oluwafisoye PA, Olowookere CJ, Jibiri NN, Bello TO, Alausa SK, Efunwole HO. Quality control and environmental assessment of equipment used in diagnostic radiology. Int J Res Rev Appl Sci 2010;3:148-58. Agahahadi B, Zhang Z, Zareh S, Sarkar S, Tayebi PS. Impact of quality control on radiation doses received by patients undergoing abdomen X-ray examination in ten hospitals. Iran J Radiat Res 2006;3:177-82. Sungita YY, Mdoe SS, Msaki P. Diagnostic X-ray facilities as per quality control performances in Tanzania. J Appl Clin Med Phys 2006;7:66-73.